Yes, I am talking about Sam Harris again. I feel like he is mentioned in half of my posts and by now you should all be his biggest fans. But to be more serious today, I want to focus on telling you how I found out about Sam and how his work and words helped me deal with some serious issues I have been dealing with when it comes to mental health. I discovered Sam back in 2016 when I was on my journey from a New Age junkie to an agnostic and finally an atheist. I was going through my Richard Dawkins phase and somehow found Sam Harris and his famous debates on YouTube. I found him intelligent and interesting, he was also very calm when debating crazy religious people, and that’s what piqued my interest in his work. By mid-2017 I was already a regular listener of his podcast and I read his book Waking Up about 5 times in a row. It soon became my favourite non-fiction book – it still is-, and I knew this man is going to change my life drastically. As I mentioned before in my post about my journey to atheism, I was meditating quite often for about a decade already, but with an intention of pleasing god and angels, not to calm my mind. Meditation for me was about proving I was worthy of help from the man above. I was reluctant to try it again once I stopped believing in the New Age trash I was feeding myself with for years, but Sam somehow ended up convincing me it was a good idea. Waking Up was just a cherry on top. I was reading the book every day. So I started meditating again. I would listen to different meditation teachers that I found on the internet and I would try it without any sounds and alone in nature. It worked sometimes but mostly I was just bored and uncomfortable. Then came the Waking Up app. I was a beta tester and had the privilege of testing the app before all of you got your hands on it, so that forced me to actually do it every single day (I wanted to give good feedback). The minute I started meditating with Sam’s voice in the background, I felt safe. You see, I have been dealing with depression and social anxiety for decades, suicide was on my mind 24/7 and recently my psychiatrist told me that I might be dealing with something more serious. Childhood trauma and genes mixed together really mess up a person, but I will prevail. 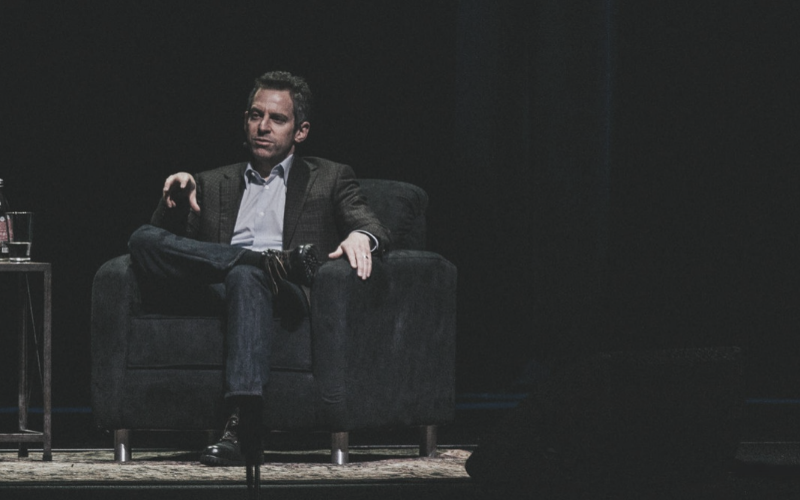 Sam Harris is one of the reasons why I am an atheist today, he is the biggest reason why I am so passionate about supporting conversations among people who stand on opposite sides, and most importantly, Sam is the only reason why I have faith, yes faith, that I can beat the darkness in my head. His voice is familiar to me now, it makes me feel safe and like I can control my mind. When he tells me to listen to my breath and observe my thoughts I actually feel like I am capable of doing it. No one has ever made me feel empowered when it comes to my mental health. Sam has been the only one who somehow got through the clutter in my mind and managed to convince me that meditation works. He also introduced me to people like Joseph Goldstein and Dan Harris about whom I wrote about in my book reviews. But it’s not only his meditation app that I love and hold dear to my heart, but also his podcast Making Sense. On his podcast, Sam talks to interesting individuals about the variety of topics that are important to be discussed in this day and age. He had some incredible guests on, my favourites include Robert Wright, Jack Dorsey and Joseph Goldstein. The day Elon Musk has a conversation with Sam will be the day my heart explodes, as Elon and Sam are two people I admire the most. 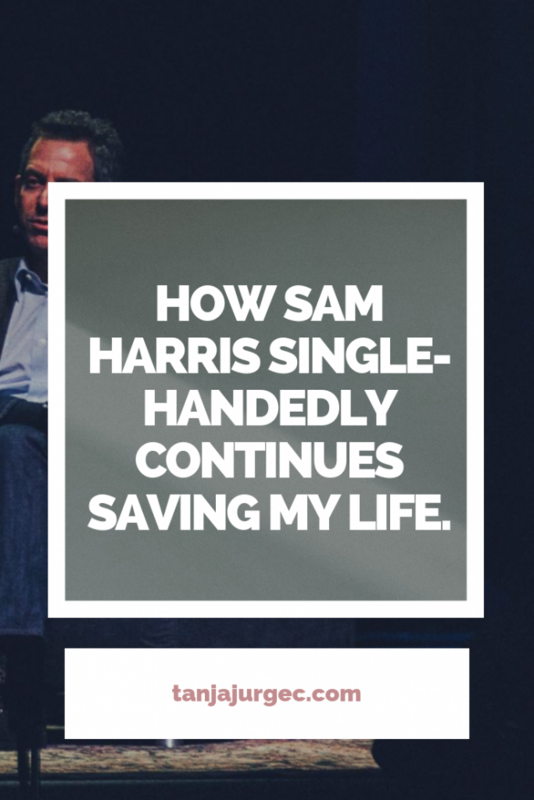 But the main point is that Sam Harris is more than just a debater, a famous atheist, a podcaster or whatever he is to the people who know his name. He is someone who selflessly shares his knowledge of meditation and mindfulness to people who seek peace and relief from suffering. I encourage you to listen to his podcast Making Sense, download and use his app Waking Up, and read all of his books (my favourite is Waking Up). p.s. – Here you can read my review of the book Waking Up. Things I don’t like about the vegan community. 5 things you can do while you are transitioning to being vegan.